The Commercial Division of High Courts Bill, 2009, under which special courts are contemplated for speedy hearing of commercial disputes of Rs 5 crore and above, would be tabled in the current session of Parliament, Union Law Minister Veerappa Moily said here today. Bihar, now ranked among the fastest-growing Indian states with an enviable expansion of 16.59 percent last fiscal, has been building one bridge each working day since November 2005, leaving Chief Minister Nitish Kumar quite busy cutting ribbons. Proper security arrangements would be made for Railway Minister Mamata Banerjee following her charges that the Communist Party of India-Marxist (CPI-M) was planning to set up a "suicide squad" to eliminate her, Finance Minister Pranab Mukherjee said Sunday. Rashtriya Rifles better option against Naxals? On account of a spurt in the number of reported honour killings in the country, couples marrying against their family wishes and khap panchayat norms have a ray of hope as a novel civil society initiative is reaching out to protect them. A strong resurgence of Telangana sentiment in the just-concluded byelections in Andhra Pradesh will mean more trouble ahead for the UPA Government.Following a decisive mandate in favour of the statehood cause, pressure is bound to mount on the Centre to take a favourable decision on the demand for bifurcation of the state. Orissa-based renowned sand artist Sudarsan Pattnaik’s creation on global warming won the people’s choice award at the Eighth International Sand Sculpture Festival in Berlin, the artist said on Sunday. Media mogul K.M. Mathew, the 93-year-old Chief Editor of Malayala Manorama, passed away early Sunday at his residence here in Kerala. Despite his advanced age, he kept working at office till the very last week, actively taking part in meetings and airing his opinions on news, especially business - his forte. The rivalry between the BJP’s two Muslim leaders - Shahnawaz Hussain and Mukhtar Abbas Naqvi - is legendary. Over the years, Hussain has constantly proclaimed that he is the true representative of the country’s Muslims since he belongs to the dominant Sunni community while dismissing his political foe Naqvi’s claims to this effect on the ground that he represents a mere 5 per cent of Shias. The countdown has started and exactly 62 days from now Delhi will be hosting the XIX Commonwealth Games. A staggering Rs 35,000 crore, it is estimated, are being spent on giving Delhi a facelift and upgrading sports facilities besides setting up the Games Village. 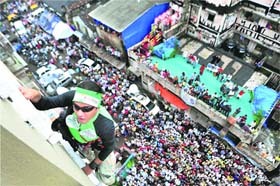 The Tribune team provides a glimpse of what is happening on the ground. He inaugurated a conference on the proposed amendments to the Arbitration and Conciliation Act, 1996, here. The commercial courts Bill proposes that disputes involving subject matter worth Rs 5 crore and above be decided by special division benches of high courts within one year. Moily said the Bill got stuck in the Rajya Sabha, but the government would ensure its passage in this session. “The economy opened up in 1991, but we did not open up the (institutions of) commercial disputes,” Moily said, adding the “general perception” in the outside world that the Indian legal system was time-consuming “must be removed”. “It can’t wait,” he said, adding the amendments to the Arbitration Act and the Commercial Courts Bill would usher in “a new era, new regime in dispute settlement”. Saying that currently companies preferred Hong Kong, Singapore, the UK, etc over India for arbitration proceedings, Moily said the situation must change. “India should become the most preferred destination for international arbitration,” he said. Talking about the pending cases in Indian courts, Moily said the government was aiming to reduce the pendency in such a way that in the next four years no case would remain pending beyond three years. Referring to a statement by an Allahabad High Court judge that it would take 300 years to dispose of all pending cases, Moily said, “This is pessimistic attitude...We have to combat the problem instead of running away from it.” About the drive to free undertrials languishing in jails for minor offences, Moily said since January 26 this year, 22,600 undertrials had been freed. "We have built 1,671 bridges under the Chief Minister's Bridge Building Programme and another 450-odd bridges under our plan and non-plan outlays since November 2005," says Bihar Road Construction Department Secretary Pratyay Amrit. "We built more than 2,100 bridges in last four-and-a-half years. That makes it close to one-and-a-half bridges every day. So, what we have achieved in the past four-odd years surpasses what was done in the past four decades," Amrit told IANS here. As a result, the turnover of the state-run Bihar Rajya Pul Nirman Nigam Ltd, mandated to build bridges, has leapfrogged from just Rs.42.62 crore in 2004-05, under the previous government of Rabri Devi, to Rs.858 crore during 2008-09 with Kumar at the helm. "Our government is building bridges not only on rivers; it is also building bridges of trust in society, connecting people of different communities," says the chief minister often, underscoring the importance he attaches to infrastructure-building. Bihar's emphasis on this infrastructure is understandable, as its bridge-building spree has helped the state government to connect better with the people in trying to realise the stated goal: "Aap ki sarkar, aap ke dwaar" (your government at your doorstep). More so since the state is criss-crossed by over two dozens rivers, largely major ones, including, Ganga, Punpun, Sone, Falgu, Kiul, Durgawati and Karmnasa in south and central parts, and Kosi, Gandak, Burhi Gandak, Bagmati, Kamla and Mahananda in the the north. "Till last year, going to Patna was a herculean task for us as we had no bridges over Punpun. We either had to wade our way across, or rely on boats," said Sanjay yadav, a resident of Jamalpur village on the outskirts of the capital city across the river. "Even though our village is barely 20 km away from Patna we had to walk to the nearest pucca (all-weather) road first that was three kilometres away and then take a local transport that would go to Patna. Now we have three bridges near our village," Yadav told IANS. "The bridges are really a blessing for over 700,000 people who live in nearby villages. You can imagine how a river can cut people off -- when you can virtually see the city across. Now, the bridges seem god-sent," added Rajaram Yadav, another villager. Road Construction Secretary Amrit said the government was also targeting large projects -- like in the case of Ganga that runs a 475-km west-to-east course in Bihar, dividing the state into two parts. "I read about it (the allegation) in the newspaper. Proper security arrangements will be made," Mukherjee, considered the number two in Prime Minister Manmohan Singh's cabinet, told mediapersons here. "The allegation has been made by a Central government minister. I am talking on the basis of newspaper reports. As I said, proper security arrangements will be made," Mukherjee said, replying to another query on the issue. The Trinamool Congress chief had made the startling allegations during a media conference at her Kalightat residence Saturday. "These cowards (some CPI-M ministers and leaders) have no courage to fight against me politically and thus forming a suicide squad to eliminate me," she said. "CPI-M and some other political parties which have vested interests - I am not speaking about all parties - have held a meeting and hatched a conspiracy to eliminate me. Such a meeting was held, you can inquire," said Banerjee, whose party is the main opposition in the state ruled for over 33 years by the CPI-M led Left Front. Dubbing themselves 'Love Commandos,' a motley group of volunteers comprising lawyers, journalists, professors, actors, students and human rights activists are through a telephone helpline offering counsel and safety to love-struck couples facing the wrath of families and village elders. "We receive calls from lovers from all over the country," says Harsh Malhotra, a social activist and Chief Coordinator of the helpline that has been operating out of a secret location. Active from July 7, the helpline had on the first day itself received hundreds of calls mostly frantic couples who rang up seeking help. The group requires member 'commandos' to be above 18 years of age and without any political party affiliation. It currently has over 90,000 members and the numbers it claims have been swelling. Around 2000 commandos are working round the clock at present for the helpline. Most of the calls received come from the areas in western Uttar Pradesh, Punjab and Haryana, regions from where most of the honour killings have been reported. "Upon receiving a call from the desperate lovers, Love Commandos inform the police and also activate their legal cell in the area. If the police do not respond, they then promptly move court seeking legal protection for the couple," Malhotra said. A strong resurgence of Telangana sentiment in the just-concluded byelections in Andhra Pradesh will mean more trouble ahead for the UPA Government.Following a decisive mandate in favour of the statehood cause, pressure is bound to mount on the Centre to take a favourable decision on the demand for bifurcation of the state. Already, there are rumblings within the ruling Congress over the leadership’s “failure to read the writing on the wall”. Though the Centre had sought to buy time by constituting the Justice BN Srikrishna Committee to examine the competing demands for and against formation of Telangana state, the by-poll outcome has sent out an unmistakable message that the people of Telangana region would not settle down for anything less than a separate state. In the bypolls for 12 Assembly seats under the shadow of a prolonged agitation, the Telangana Rashtra Samithi, spearheading the statehood movement, made a clean sweep, winning all 11seats it contested while its poll ally BJP bagged one seat. 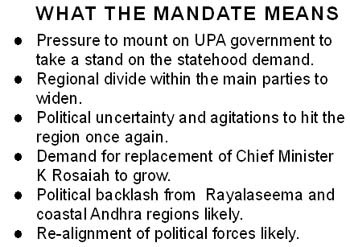 So comprehensive and unambiguous was the mandate that the Congress and the main opposition TDP lost deposits in several constituencies. The biggest setback for the ruling party was the defeat of its state unit president D Srinivas at the hands of BJP in Nizamabad constituency, his second electoral loss in a row. While poll outcome has come as a big boost for the Telangana movement, it triggered an internal churning in the Congress and the TDP. The pro-Telangana leaders within the Congress have made it clear that they would vigorously pursue the issue with the high command. “This is a clear mandate for separate Telangana state. It is our duty to expedite the process for formation of the new state. We will soon meet our president (Sonia Gandhi) and request her to honour the public sentiment,” senior Congress leader and CWC member K Kesava Rao. While the Srikrishna Committee is expected to submit its report by December 31, the Telangana protagonists in the Congress want the government to take a decision before the deadline to wrest political advantage and take the wind out of TRS’ sails. They argue that granting statehood would greatly benefit the party in the next elections. “There are twin benefits. First, we can rightfully claim the entire credit for carving out Telangana and fulfilling a long-cherished dream of the region. Second, we can marginalise the opposition TDP in the region,” a senior MP said. During his glittering journalistic career, Mathew was the Chairman of Press Trust of India, president of the Indian Newspaper Society and the chairman of the Audit Bureau of Circulation besides holding numerous other positions. Mathew became the managing editor of Malayala Manorma in 1954 and became the Chief Editor after his brother passed away in 1973. The highly acclaimed English news magazine - The Week - was his brainchild. But, if there was one thing Mathew failed to achieve was an English daily from the Manorama group. The first issue of Malayala Manorama appeared March 22, 1890. It started as a four-page weekly newspaper published every Saturday and since then it has not looked back. Today, it is a media group that has 48 publications with Manorama having a circulation of more than 1.8 million copies. It was under Mathew's stewardship that the Manorama group of companies adapted to the changing times in the media industry and did not have to think twice before entering into the arena of the electronic media. He also launched the online medium of Malayala Manorama. The rivalry between the BJP’s two Muslim leaders - Shahnawaz Hussain and Mukhtar Abbas Naqvi - is legendary. Over the years, Hussain has constantly proclaimed that he is the true representative of the country’s Muslims since he belongs to the dominant Sunni community while dismissing his political foe Naqvi’s claims to this effect on the ground that he represents a mere 5 per cent of Shias. This was his favourite line till recently. Ever since Naqvi’s son got married, former civil aviation minister Hussain has changed his tune. He has now started positioning himself as the only face of Muslim youth in the BJP. How can a man with a married son claim to be a youth leader, Hussain asks in private conversations, adding emphatically that he is a true “young leader” and not Naqvi. While the government appears quite relaxed over its continuing stand-off with the Opposition in Parliament, it is the Left parties which are getting increasingly restive and pressing for an early settlement. Marxist leaders privately admit that that the longer they are seen in the company of the BJP, their credibility is taking a bad hit. It is the last thing the beleaguered Left parties want at this stage as they brace up to face a particularly tough Assembly poll in West Bengal. The Left leaders have been trying to hard to chart an independent course on price rise but their efforts have all come to nought. Last week, when they decided to stage a dharna at the Gandhi statue outside Parliament, the Left delegation found itself upstaged by Samajwadi Party leader Mulayum Singh Yadav who had occupied the spot before its arrival. After getting himself photographed in the company of very uncomfortable Left leaders, it was the turn of Janata Dal (U) chief Sharad Yadav to do the same. Shortly afterwards, when the protesting Left MPs moved to address television cameras, RJD chief Lalu Prasad Yadav joined them to be seen prominently in the company of the Marxists. Since then, it is the Left leaders who have been urging the UPA’s floor managers to resolve this crisis at the earliest. The government is clearly enjoying their discomfort and is not exactly rushing to end this logjam. Visiting British finance minister George Osborne took time off from his official engagements to attend a private dinner hosted at the sprawling Maharani Bagh residence of adman Suhel Seth, who is better known as an expert on everything from the state of Indian polity to the latest beauty treatments in town. The guest list, according to an insider’s account, comprised the usual suspects. There was a sprinkling of politicians like Jay Panda, Sachin Pilot, Jyotiraditya Scindia and Arun Jaitely, a number of high-profile industrialists and a clutch of journalists. The conversation, it is said, was quite banal and, contrary to expectations, the evening turned out to be fairly boring. It was enlivened briefly with the arrival of disgraced former junior minister Shashi Tharoor, dutifully accompanied by fiancée, the now-famous Sunanda Pushkar, who unleashed a charm offensive on all the guests. The buzz at the dinner was the two are finally getting married on September 29 in Dubai. Watch this space for more. Timing Clockwork precision is the hallmark of all mega events marketed for Television. But then we are not exactly known for teamwork or good timing. Failure to control crowds A known weakness that requires to be overcome. Delhi traffic It remains to be seen whether traffic hits the Games or the Games hit the traffic. Infrastructure glitches Have faith in PWD, MCD and DDA engineers. Keep your fingers crossed. Low turnout It would be a pity if the events are seen primarily by officials, securitymen and the media. Rains Heavy rainfall in October is rare but cannot entirely be ruled out either. Scramble for the spotlight Indian officials and politicians are known to scramble for photo-ops, for occupying seats reserved for others and jostling for a vantage position. Power breakdown It would be embarrassing if power trips during the opening and closing ceremony. Terror strike The most serious challenge is to foil attempts by sundry terrorists who may attempt to disrupt the Games and ensure safety for athletes and spectators alike. Rude behaviour People in Delhi are not quite known for their gentle manners. And our ‘culture’ does not inhibit passing rude or racial comments, ridiculing people, making fun of them or taking them for a ride. l CWG Organising Committee claims 26 new training venues have come up in preparation of the Games. 16 existing training venues are claimed to have been upgraded. 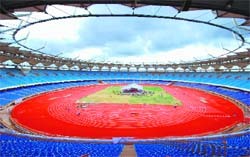 l The opening & Closing ceremony at the Jawaharlal Nehru Sports Complex with a capacity of 60,000.
l Tickets for the Opening Ceremony available for Rs 5,000, Rs 25,000 and Rs 50,000 (reserved seats). l The Rs 1000 tickets for the opening ceremony are unavailable. l The Metro expansion to connect Gurgaon to CP ( Rajiv Chowk) to Pragati Maidan and the Jawaharlal Nehru Sports Complex. l A four-lane , underground 2.2 Km stretch from Ring Road to cut travel time. l 1,100 low-floor, AC buses to operate in the city. l 20 new hospitals coming up. l 9 new, automated car parks with capacity to handle 7,500 vehicles. l 12 new flyovers being built. l CP and Janpath acquiring a new look. l Indira Gandhi International Airport now has a new and longer runway and the new Terminal 3 equipped to handle more passengers and baggage. l The opening and the closing ceremony will be held at the Jawaharlal Nehru Sports Complex with a capacity to hold 60,000 spectators. l Athletics, weightlifting and Lawn Bowl events also to be held at JNSC. l Thyagaraj Sports Complex, near the INA market, with a capacity for 4,494 spectators will hold Netball events. l Indira Gandhi Sports Complex near Indraprastha Metro Station will host Gymnastics, cycling and wrestling with capacities for 14,348, 4000 and 6,932 spectators respectively. l Dr S.P. Mukherjee Swimming Stadium near Patel Chowk to hold swimming and diving events. It will be able to accommodate 5,178 spectators. l Boxing events are slated for the Talkatora Indoor Stadium, also near Patel Chowk. 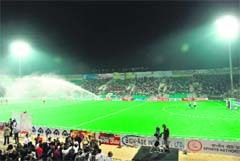 l Major Dhyan Chand National Stadium with a capacity for 19,118 spectators will hold hockey events. l Badminton and Squash events will be held at the Siri Fort sports complex with capacity for 4,748 and 3128 spectators. l The Dr Karni Singh Shooting Range, near Kalkaji temple, will hold the shooting events. l R.K. Khanna Tennis Complex near Green Park has a capacity for 5015 spectators. l Table Tennis and Archery events will be held at the Yamuna Sports Complex near Karkardooma with a capacity for 4,297 ) TT) and 1,500(Archery). Opposite Jantar Mantar, at CP, it occupies 9 floors and is designed to provide working space for 1,200 people. It has multi-level parking lots and 24-hour power back-up. If Delhi Police is to be believed, the security for the 12-day Commonwealth Games (CWG) in the national capital would be unparalleled with air patrolling, snipers and a four-layered protective cordon around the sports venues and the Games Village, making them virtually impregnable. According to Neeraj Kumar, Special Commissioner (Administration) who is entrusted with security, 82,000 Delhi police personnel and around 20,000 security personnel from other paramilitary forces would be on guard during the games. Police officers believe that armoured cars, air surveillance and other security instruments, including Cargo Scanner, should secure the city. “We are prepared for any eventuality,” insists Delhi police commissioner Y S Dadwal. However, officials admit that the delay in completion of CWG projects has made their job of securing the venue a tad difficult as they would be left now with fewer days to do the job. 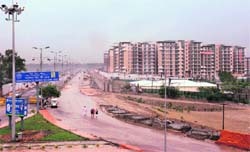 While security officials generally avoid talking about the security details for obvious reasons, it has been made very clear by the Delhi police that Games venues, the Games Village, practice venues and parking lots along with Indira Gandhi International Airport (IGIA), where the athletes will arrive, will have a four-layered security cordon, "outer, middle, inner and exclusive" security zones. According to Neeraj Kumar, at the outer cordon the traffic will be stopped and access will be controlled. At the middle cordon, security personnel will channelise the spectators to their designated seats while in the inner cordon, the barcode reading of tickets will take place and the spectators' photos captured. In exclusive cordon, each and every person would be frisked physically no matter who he is. According to information available, entry of vehicles to the village would be checked by Radio Frequency Identification Code apart from Under Vehicle Scanner. “Even if a vehicle manages to break the barrier and rushes in, the Tyre Killers followed by Road Block would be there. Besides the CCTV cameras, Hand Held Metal Detectors and X Ray Baggage Scanner would be at every nook and corner,” said a senior Delhi police official. He also pointed out that apart from the usual security officials, the Chemical-Biological-Radioactive-Nuclear Explosion (CBRNE) Team would be at the village 24x7 to thwart chemical attacks. Besides, the Delhi police has also procured Cargo Scanner which will be used for the first time to check the cargo trucks and other big vehicles. According to Rajan Bhagat, Delhi police Spokesperson, the city police is also procuring three armoured cars which would ferry a Special Weapons and Tactics (SWAT) team around the city. According to police sources, there will be surveillance from the skies with the help of the Indian Air Force. “There will also be deployment of assault teams to thwart any attempt by terrorists. A sniper team will patrol the skies over the games venue during the action and any threat would be dealt with promptly,” revealed a police official. According to information, Terminal 3 at the IGIA has been earmarked for the exclusive use of athletes, officials and their families arriving in the country or leaving it. “Terminal 3 area would be manned by CISF personnel with additional support of snipers, Commando Strike Team, Foot Patrolling and various electronic gadgets to thwart any terrorist attempt. A Quick Reaction Team (QRT) would be taking position at every 2 kms on route from the airport to the games village to tackle any emergency situation. According to information, the QRT would be placed at strategic places and would have ambulances and contingency plans of changing route in case of emergency situation during the transporting of athletes or officials. As the possibility of the spectators, thousands of whom would arrive, being targeted by terrorists is always there, Delhi Police has installed CCTVs in 14 markets of the city and the exercise is undergoing at 29 other markets. Police would also guide players and officials about which markets they should visit. According to Kumar, athletes will not be ferried in bullet-proof buses as demanded by Pakistan, which also raised some queries regarding security provided to VIPs at a two-day conference on Games security here. The officer underlined that Delhi police does not feel the need of having bullet-proof buses and we are capable of thwarting any untoward incident. Sri Lankan Cricket Team, it is worth recalling, was attacked by terrorists in Pakistan while on its way to stadium last year. But police officers do not appear unduly worried here. Located in the backdrop of Akshardham temple in East Delhi, the Games Village will host some 8,000 athletes, coaches and officials for a fortnight in October. But expected to be ready by March this year, the construction is still on. It’s a most unlikely village. It will have 1,168 ultra-modern premium apartments spread across 34 towers built over a total area of 27 acres of land with its inhabitants having access to some of the most modern amenities. Welcome to the Commonwealth Games Village, the official address of the international athletes, delegates and coaches during the fortnight-long Commonwealth Games (CWG) starting on October 3. The village, which is a part of complete infrastructural makeover of the national Capital, will house more than 8,000 athletes and officials during the Games. Located in the backdrop of famous Akshardham temple in East Delhi, the village will be the hub of Commonwealth Games and is expected to be a big draw for tourists, largely because of its proximity to the temple. It is being developed with a public private partnership between the Delhi Development Authority (DDA) and construction company Emaar MGF. It will be one of the key developments of this sporting event and will be a defining example of superior Indian skills and capabilities, a top DDA official said. The proposal of the games village, which earlier had to go through stiff opposition from environmentalists who were against its construction for its allegedly hazardous consequences to the Yamuna, was given the go-ahead after judicial intervention. “The village is going to be a landmark for Delhi. It will provide international standard facilities to athletes with features like tennis courts, half-court basketball, 30-metre lap pool with recreation bay, bubble pool and health club with fully equipped gym,” said Anupama Chopra, the official spokesperson of the company. Close to the Yamuna sports complex, the village will host archery and table tennis events. Delhi MLAs during the previous session in the Assembly had demanded from the government that they be allotted the flats once the games get over as many of them do not have a house of their own. The self-serving and clearly illegal demand of the legislatures was rejected by the government but MLAs, cutting across party lines, were firm in asking for the allotment. The apartments are likely to fetch astronomical prices once they are sold in the open market after the games. “With more than 73 per cent greens and open spaces, the whole area will be landscaped with gardens, walkways and pathways and 2,500 tree saplings will be planted on the site. It will obviously command great interest among the high-end buyers,” Chopra said. However, the slow pace of construction is giving jitters to the state government and to the organisers. The village, which was expected to be ready by March 31, is still under construction. Though the Delhi government has set a fresh deadline of August 31 for the completion of all the games related work, the village could miss the deadline again. On a recent visit to the village by Delhi Finance Minister AK Walia and several senior DDA officials, the pace of the work was found to be unsatisfactory. “There is a lot of work pending and much effort needs to be put in. The way the work is going on, I have doubts over timely completion of some of the projects,” Walia had said. “Things have improved since the last time we did inspection, but there is still a lot left to be done,” he said.